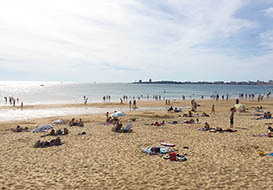 One of the best loved holiday destinations in France, the Vendee has a an enormous choice of self catering holiday accommodation and rental properties to suit all tastes and all budgets. 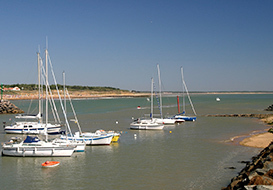 Just a little inland from the busy coast you can find perfect holiday homes in quiet rural villages and still easily get to the coast, offering a great combination of a relaxing stay in a country spot and day's out to the the Vendee beaches for the children. Whilst you can always find accommodation that is cheap... for a good level of quality you should count on spending between € 190 and € 280 (£160 to £240 at 1.15 €/GBP) per person per week in peak season. Prices in June and September will be typically reduced to 60% to 70% of these rates, so those without school-age children can get better value for money by choosing dates just outside the peak season. It's worth noting that the weather in June and early July is usually excellent and things are a little calmer in the tourist hot-spots. Early September has also had consistantly superb weather in recent years. The price normally reflects what you will get, either in the overall quality of the accommodation, in the facilities provided, or the geographic location. 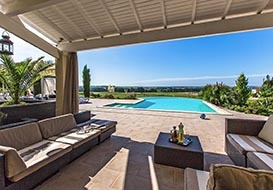 Holiday rentals with swimming pool will be more expensive, particularly when it's for sole use, and those right on the coast will be nearer the top prices. Judging the quality can be difficult, but looking at the photos with a critical eye will generally give you a fair impression. In France there is a national quality rating system, 1 to 5 stars, (or an equivalent rating from a specific organisation like Gites de France) although this is not always stated. You can also search our Vendee Directory for your ideal Vendee holiday cottage, gite or villa, by selecting the categories or features that you need. Is on-line booking better ? The short answer is no. The major brand websites for holiday rentals now propose a system of on-line booking and encourage (or even bully) people to use this facility. Whilst this can offer some simplicity there are some important things that you need to bear in mind. See our detailed article on on-line booking. Available in school holidays ? It can be difficult finding weeks still available for the peak summer period, particularly if you have started looking for holiday accommodation rather late on. The most popular holiday rentals often fill up all the peak season by mid February. The Vendee-Gites.com website has a useful summary chart showing which weeks are still available accross all of their properties. The chart is updated in real time and you can ask for available dates to be held for you while you decide or while you book your travel. 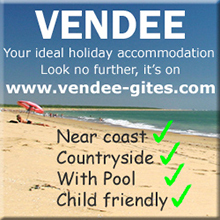 See their Vendee holiday availability chart for this season. The property owner or agent will be glad to advise you on the suitability for any special needs. In most cases this concerns the accessability for reduced mobility or wheelchair and it is possible to find holiday rentals that have been specifically designed with this in mind. Buchenois, near Lucon - Cottage La Roseraie is approved for wheelchair access and reduced mobility guests. Approved by the organisation "Tourisme et Handicap" (Gound floor bedroom with en-suite, large floor-level shower, open space under basin, adapted toilet, large living space and improved access to kitchen surfaces). 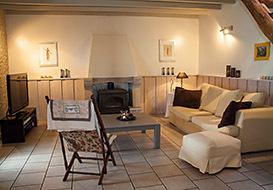 Le Bocage, near Le Poire sur Vie - This farmhouse is adapted for wheelchair access and reduced mobility guests. Downstairs suite with fully wheelchair accessible shower room and toilet and kitchenette. All the interior and exterior spaces are tiled and with easy slopes. 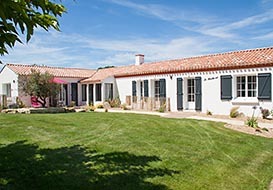 See also Le Logis de la Mariniere, which has similar facilities. 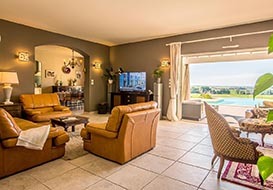 Some of the villas at Les Jardins d'Olonne are suitable for wheelchair users, offering confortable accommodation with private pools, a bar and restaurant on site and situated near to beaches. If coming from the UK you will need to take your dog to a local vet for the mandatory check before returning home. 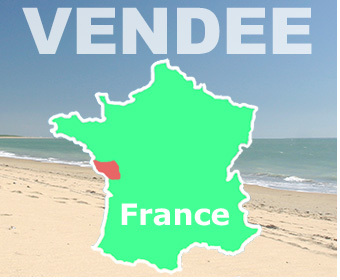 Here is a list of the 80 vetinary clinics in the Vendee, with contact details: Vets in the Vendee. These holiday cottages or villas will accept a well behaved pet. Note that in some cases there may be a supplementary cleaning fee. 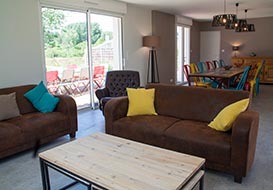 Le Domaine des Plantes, near St Gilles Croix de Vie - This villa near the coast accepts pets. L'Oasis de Drappelle, near Green Venice and La Rochelle - Riverside cottage with pool, dogs accepted. Le Clos du Baron, near St Gilles Croix de Vie - Quality villa in a rural location, dogs accepted. Le Griffier, near Fontenay le Comte - Gite with pool in a rural location, dogs accepted. 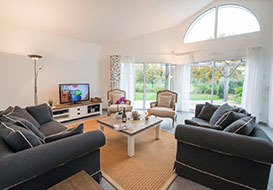 Les Jardins d'Olonne, near Les Sables d'Olonne - Some of the villas at will accept pets, offering confortable accommodation, private pools and easy access to beaches. 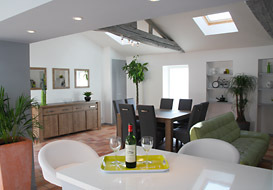 Villa Tanchet, at Les Sables d'Olonne - Quality sea front villa next to the beach. 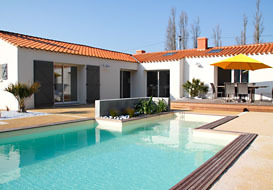 Villa Colombier, at les Sables d'Olonne - Villa for up to 9 people with private pool, near the beach. See details and a map of vehicle charging points in the Vendee. Strangely enough, relatively few people seem interested in saving more money on the price of their self catering accommodation by taking advantage of special offers and late bargains that many holiday property owners propose on remaining weeks. Perhaps people feel that if it's not already let at full price there must be something wrong with it... This is obviously not necessarily the case and, for example, this may be just the result of a late cancellation. Some larger holiday properties will always have reduced rates for smaller groups outside the school holiday period. See discounts for small groups outside high season. 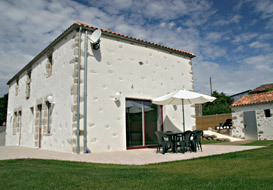 Vendee bargains on remaining weeks and late availability. The Vendee is a superb destination for low season breaks, offering good value, especially when combined with budget airline flights. The area is well known for its great climate, which extends the holiday season with the possibility of lovely weather from April to October. Prices start at around € 500 (£435 at 1.15 €/GBP) for a week's rental in low season and many holiday properties can be let for 5 or 10 night stays or with offset start days outside of the main season. Some larger properties offer reduced prices for smaller groups outside the peak season dates. Here are a few examples of great value mid and low season rentals. 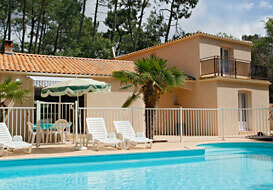 Villa near Les Sables d'Olonne - great for low season break, from €795. 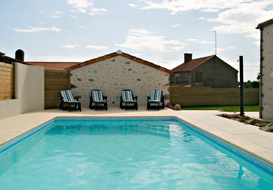 Vendee farmhouse with heated pool from € 560 pw for 6 people. 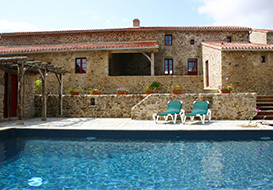 Cottage on the coast, from € 520 pw for 2 to 4 people. See more open in low season. So easy to get to, only 3 hours from the ferry port of St Malo, or with budget flights to Nantes or La Rochelle. A beautiful climate offering a long holiday season. 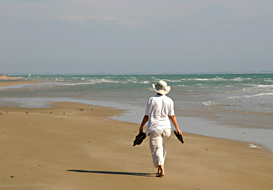 Some of the best coastline in France, with its vast sandy beaches and lovely islands to visit. Plenty to do, with historic towns and charming villages, not to mention the fascinating Green Venice area, loads of theme parks and endless holiday activities. Find out more. Check out our Vendee Directory to find your ideal rural gite, country cottage, or coastal villa, most with swimming pools. Find local attractions, places to vist, restaurants and more... Search by category or by map. 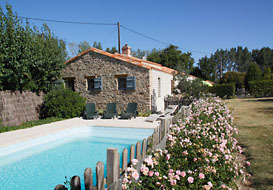 Charming rural farmhouse with heated pool in pleasant coountryside. A short drive to shops and amenities, under an hour from the coast. In a quiet rural spot just outside the town of Lucon. Character interior and a lovely private pool. Half an hour to the coast. 3 bedroom cottage in a rural hamlet. 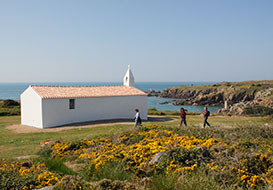 Easy acess to a bathing lake and the Vendee coast. Confortable interior and enclosed garden. 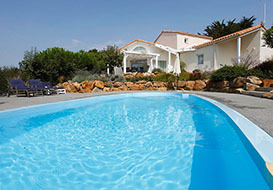 Large quality villa on the coast at Jard sur Mer. Cycling distance to the beach, the port and village amenities. Confortable interior and fenced pool. Spacious quality villa on the coast near a popular resort town. Cycling distance to the beach and town amenities. Confortable interior and large grounds. Exceptional luxury villa overlooking vineyards. Spacious accommodation and extensive facilities. Near to a bathing lake and aquatic centre, easy access to the coast and historic towns. One of several sumptuous villas in an exclusive residence complex on the coast. 2km from the nearest beach. 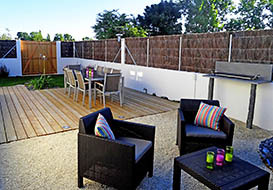 Tennis courts, mini-golf, play area, cycle hire and restaurant are available on site. Water mill, farmhouse, cottage and fully equipped function room. 3 to 7 night rentals for the whole site around weekend dates for weddings, family gathrings and functions. Magnificent riverside setting. 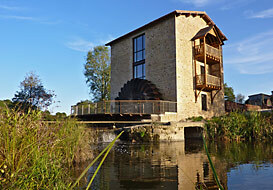 Association HATPM - Gites and B&B in the south Vendee. 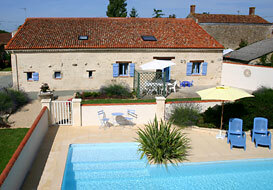 Gites-with-pools - 5 cottages in an attractive countryside complex at L'Hermenault. Logis de Bourseguin - Logis for 12 and cottage for 7, near Fontenay le Comte. L'Albizia - Gite for 8/10 with indoor pool near Moutiers les Mauxfaits. Le Bois Berranger - Gites (and B&B) with pool. Saint Urbain, near Challans. 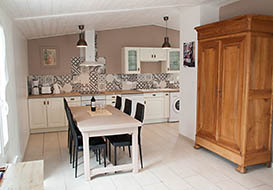 La Tavennerie Gite for 4, jacuzzi, near Nantes & Puy du Fou, 1 hour from coast. A lovely sea front villa next the beach, just outside Les Sables d'Olonne. Four bedrooms, sleeping up to 9. Cycling distance to the town centre and all amenities. Charming top quality cottage in a rural location. Private heared pool, sleeps 5.